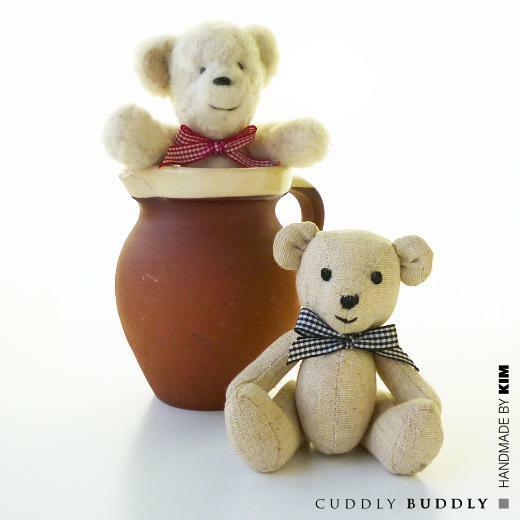 Sew this cute 13cm (5") teddy bear with fabric or felt. Sitting teddy measures approximately 9.5cm (3 1/2"). Fill with toy filling and add two tiny beads for eyes, embroidered nose and mouth and then he's ready to play! Experiment with different fabrics. The teddy in the jug was sewn in felt and when completed he was needle felted with natural curly wool. One printable sheet in jpg format.